While nearly 40 percent of Florida homes have a pool, if you are one of those homeowners, you already know how popular you become during the summer. 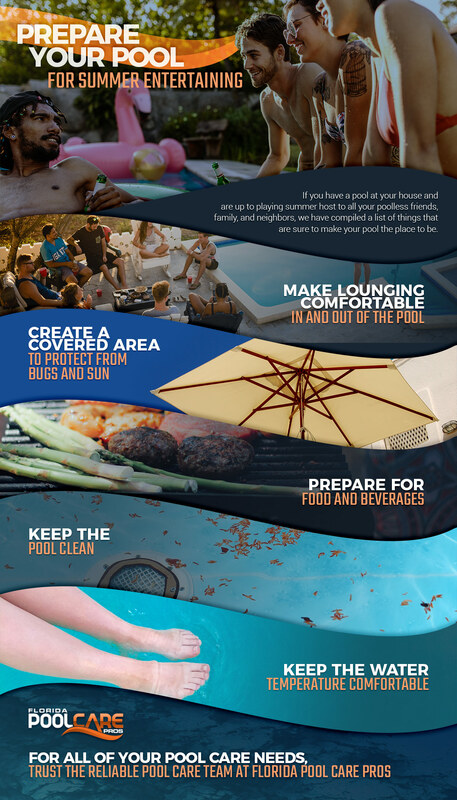 If you have a pool at your house and are up to playing summer host to all your pool-less friends, family, and neighbors, we have compiled a list of things that are sure to make your pool the place to be. 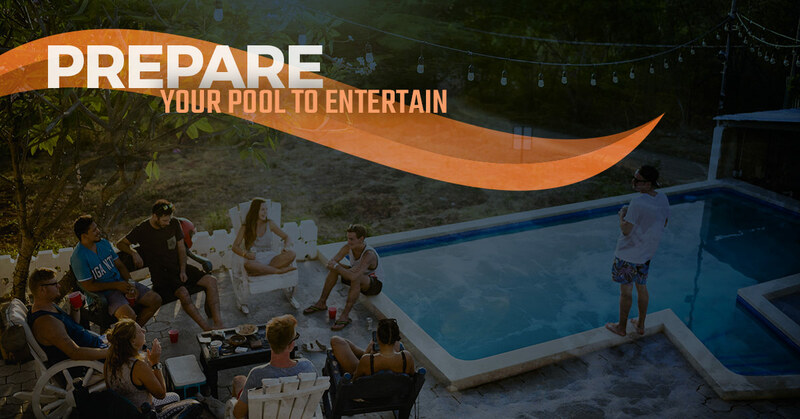 If you followed our advice in our previous blog and your pool is already ready to be opened for the season, you’ll just need to get your entertaining game on point. If you’ve got some regular swimmers, don’t hesitate to ask them for their help with labor or finances! Everyone enjoys the pool for a spot to cool down and splash around in, but most people spend much more time lounging around the pool than they do in the pool. To maximize the comfort level of your home’s swimming pool, you’ll have to start with the lounging equipment. If you have basic plastic outdoor chairs, you may want to consider upgrading to pool loungers that make sunbathing easier or benches to provide seating for a variety of guests. While you can encourage guests to bring their own floaties, having a few on hand makes things fun even when you get the pool to yourself. If your pool is not screened in, you may want to seriously consider it. Not only will it help keep plant life from falling or blowing into your pool and decrease the frequency of cleanings, but it can also cut down on the number of bugs and animals (alligators) that wander into your water. Creating a covered pool area helps keep your guests more comfortable and helps keep you from swatting away pesky bugs. As part of the screened enclosure, it isn’t a bad idea to make it partially covered with more than just a screen. Screens still allow a great deal of sunshine to get in, which is great for sunbathing and keeping things comfortably warm, but the shade is also nice every once in a while. If you don’t want to include a roofed portion of your screened in pool porch, you can always provide an umbrella or awning over a table or loungers. Prepare for Food and Drinks! The ideal pool experience includes some delicious beachy cocktails and a freshly grilled burger. Creating a grill space and including a refrigerator or custom cooler for drinks helps to keep everything in one area and designates the space for satiating your guests. It is never a bad idea to let your pool guests know they are responsible for supplying the food and drink. It is every pool owner’s dream to have a bar poolside. It is easy to create a custom bar that suits your needs, whether it is a simple shelf to hold glasses and bottles or a full-service bar complete with mini-fridge and a place for guests to sit. If your pool is the place to be during Florida’s swimming season, you want to make sure it is prepared to entertain! Part of making a pool comfortable and attractive is keeping it clean and operating. For all of your routine pool service and repairs, including weekly cleanings and inspections, trust the pool experts at Florida Pool Care Pros. For more information or to schedule your service, contact us today!